You are here: Home / Finance / Frugal Christmas Decorating Tips! The Grocery Shop for FREE podcast is here! 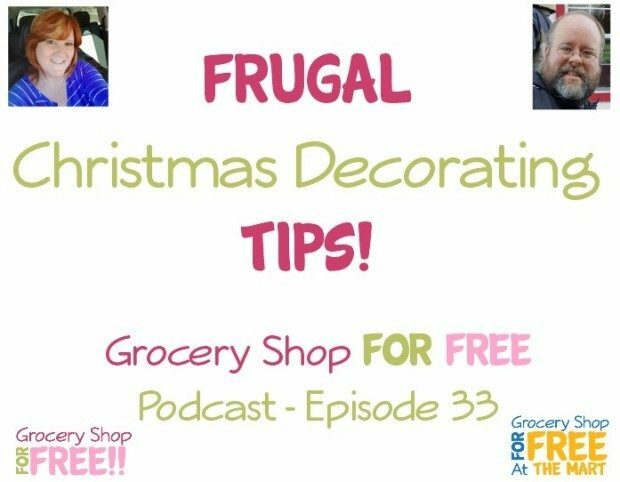 This week we are joined by Victoria Huizinga of Snail Pace Transformations as we talk about frugal ways you can get your home ready for the Holidays. Remember to subscribe on iTunes or Stitcher and leave us a review! Tic Tac Singles Packs And Tic Tac Mixers Just $0.29 Each At Target! Kleenex Just $0.20 At Walgreens! Nature’s Harvest Bread FREE PLUS Money Maker At Target! Huggies Wipes Just $0.45 At Walgreens! Pillsbury Grands Jr. Just $0.59 At Target! ZonePerfect Bar FREE At Target! Lysol Disinfecting Wipes FREE With $1.00 Money Maker At Rite Aid! M&M’s Chocolate Candies Just $0.50 Each At Walmart!